The following cannot ever be overstated — dural fistula is a venous congestion disease. Nearly all adverse effects due to dural fistulas of spine or brain, with few exceptions such as pulsatile tinnitus, are related to venous congestion. In the brain, the most common fistula is the sigmoid sinus one, and the principal branches supplying these are occipital, ascending pharyngeal (neuromeningeal trunk) and middle meningeal pedicles. Drainage proceeds antegrade into the jugular vein or retrograde towards the torcular. Almost never is there reflux into cortical veins so long as one or both of these pathways are open. 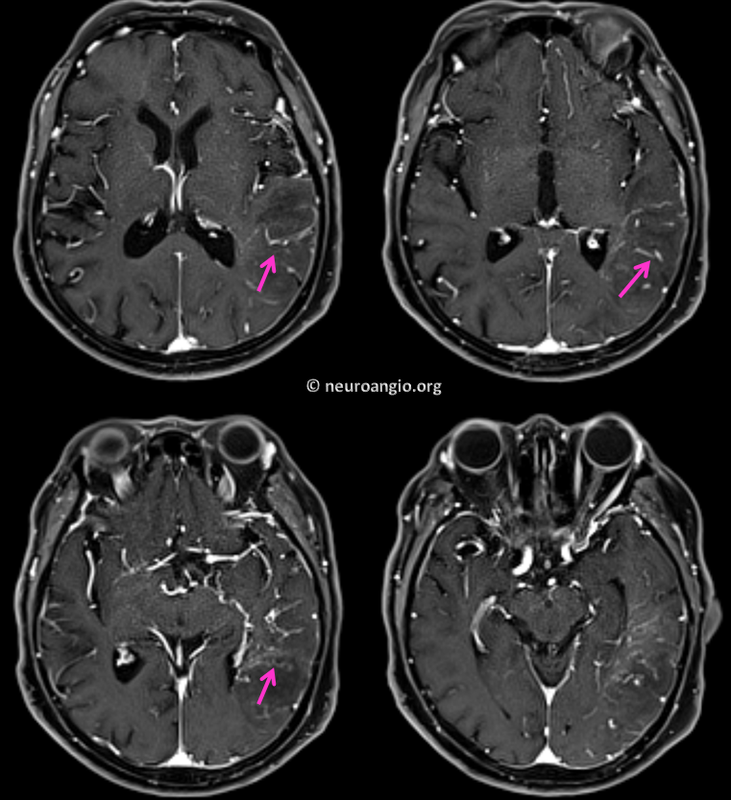 However, when both transverse sinus and jugular outflow are closed, either due to flow-related venopathy or some other mechanism, the outflow has nowhere to drain except into the cortical veins. What happens next depends on the extent to which the cortical veins are collateralized. If, for example, the fistula drains into a Labbe which is well-connected to the sagittal sinus or cavernous sinus, then not much may happen. If, however, such connections are poor, then venous parenchymal congestion and hemorrhagic venous infarction results. The following case shows the extreme of such pathology. 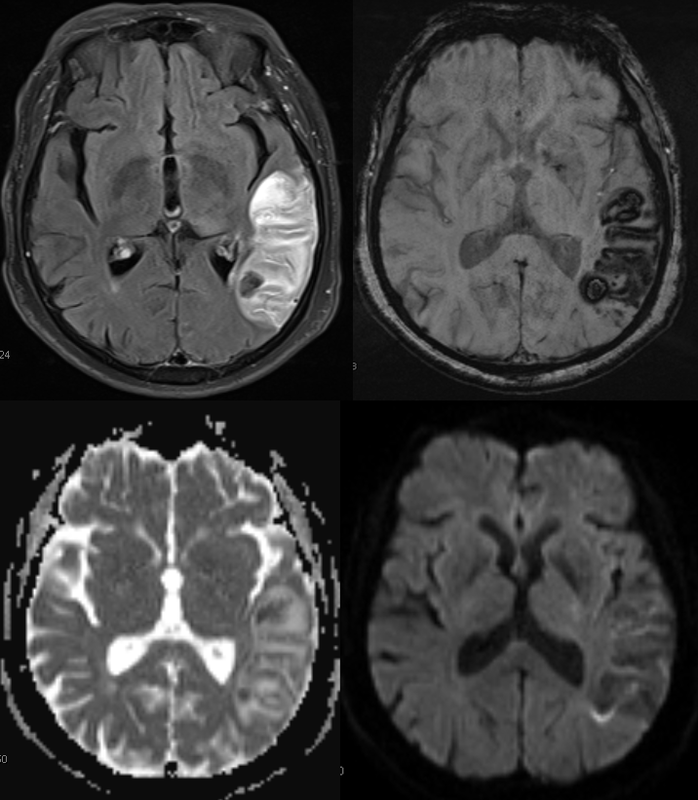 An elderly woman presents with mild receptive aphasia, which rapidly progresses over the next two days. 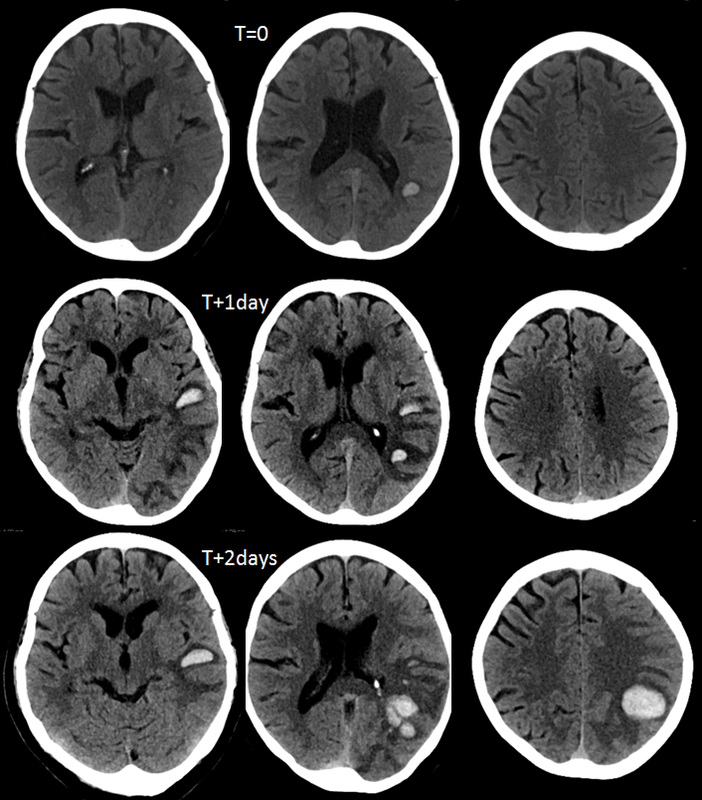 CT scans show evolving left temporal/parietal hemorrhage. Contrast-enhanced images beautifully show engorged transmedullary veins attempting to decompress the parenchyma into the subependymal network of the deep venous system. See superficial venous system and deep venous system pages also. Back to our case. 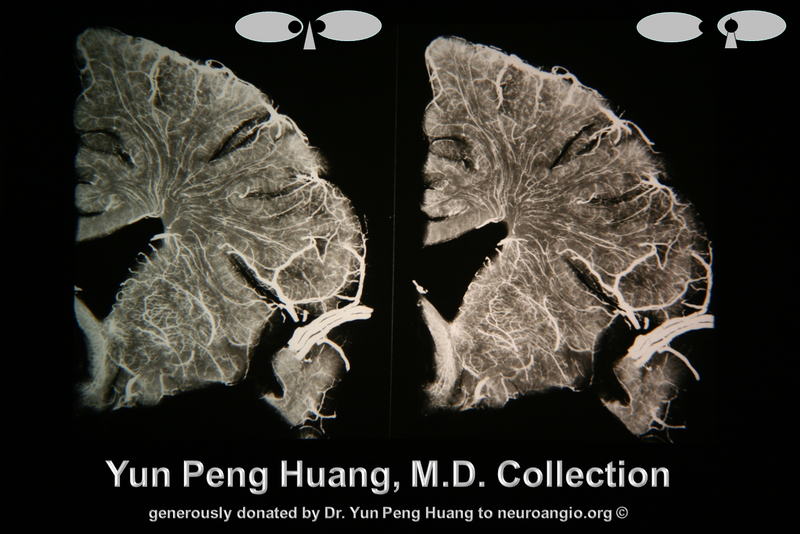 The transverse and sigmoid sinus appear rather unremarkable on post-contrast images. Precontrast images showed no T1 hyperintensity. No time of flight imaging was performed. Now on to the real thing — angiography. Stereo pair vertebral injections show that, in fact, the left transverse, sigmoid, and jugular seem to be closed. 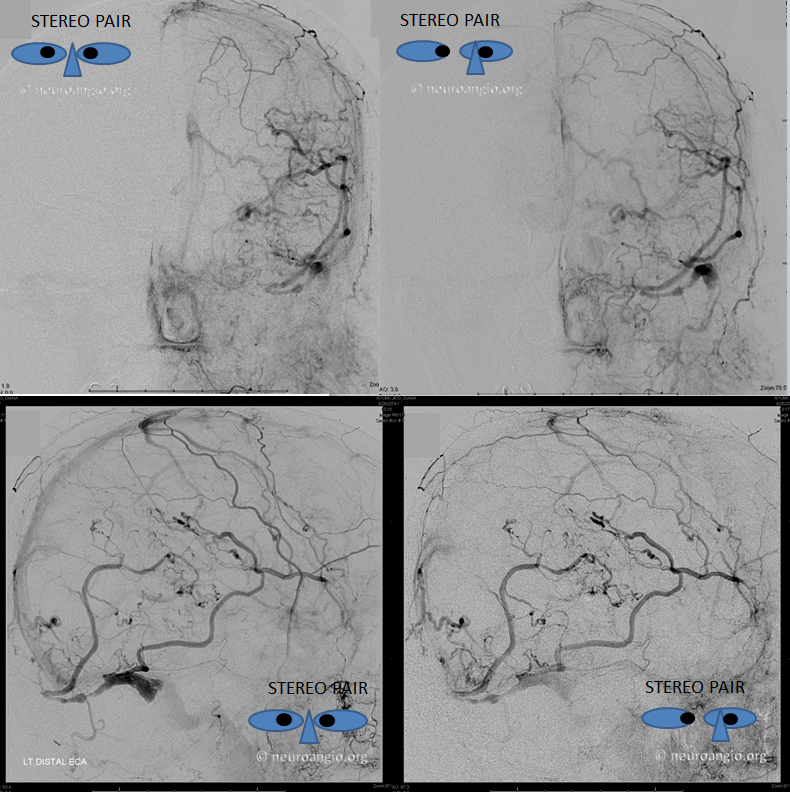 Left external carotid injection, frontal and lateral views, early arterial, early venous, and late venous phase images. 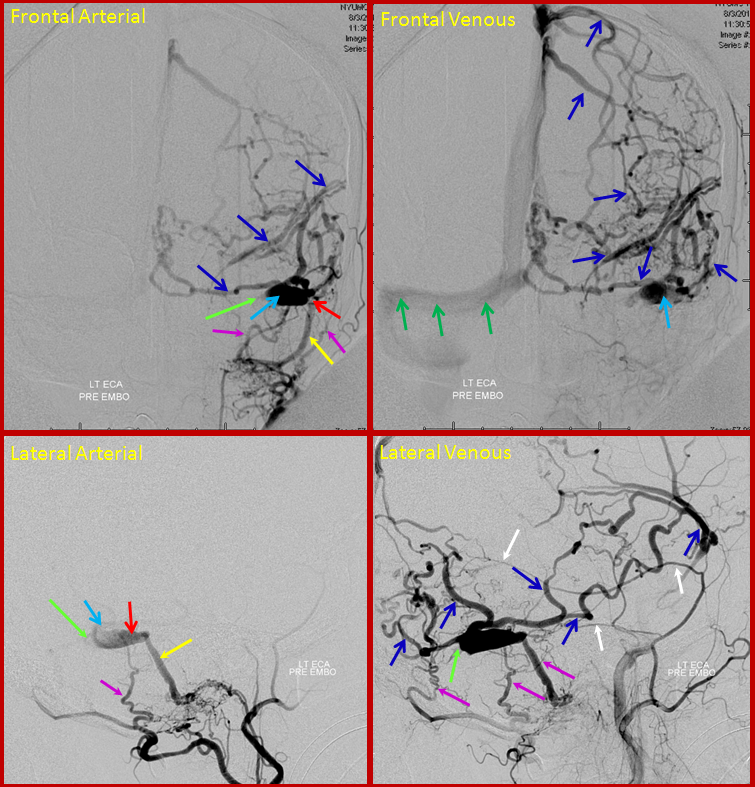 Transmastoid branches of the occipital artery (yellow) and petrosquamosal branch of the middle meningeal artery (red) are sullpying the fistula, with remaining sigmoid sinus venous pouch (black) and occlusion of the proximal sigmoid sinus and transverse sinus. 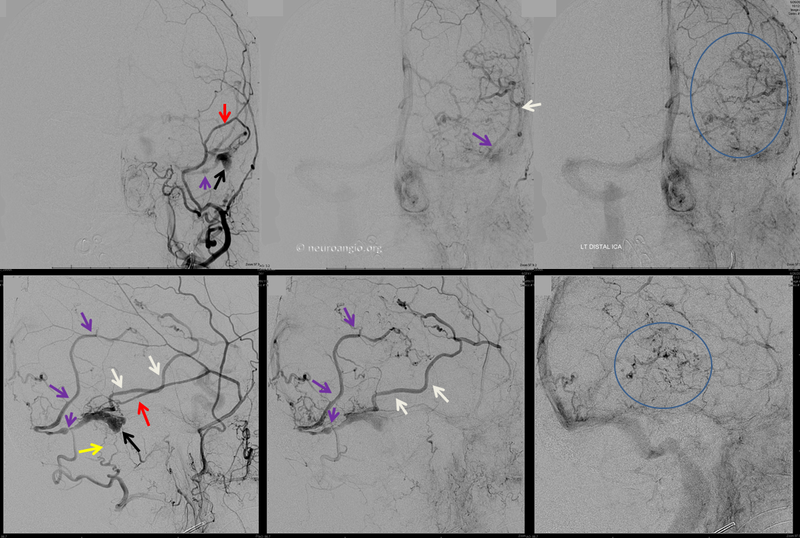 The fistula outflow is directed exclusively into cortical veins of Labbe (white) and temporoparietal vein (purple). Neither vein has any collateral connections with other surface veins of the left convexity and therefore is unable to decompress into the superior sagittal or cavernous sinuses. 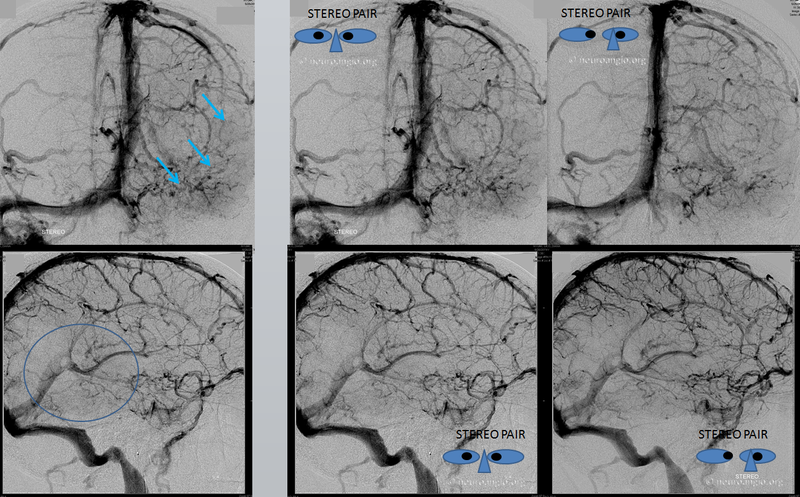 Instead, egress proceeds into tremendously congested transmedullary veins (blue oval AP view top right image) which were seen on the MRI. Notice breakdown of the venous apparatus with active contrast extravasation into infarcted tissue (blue circle on lateral view, lower right image). For followers of classification, this is a classic Cognard Type IIb. 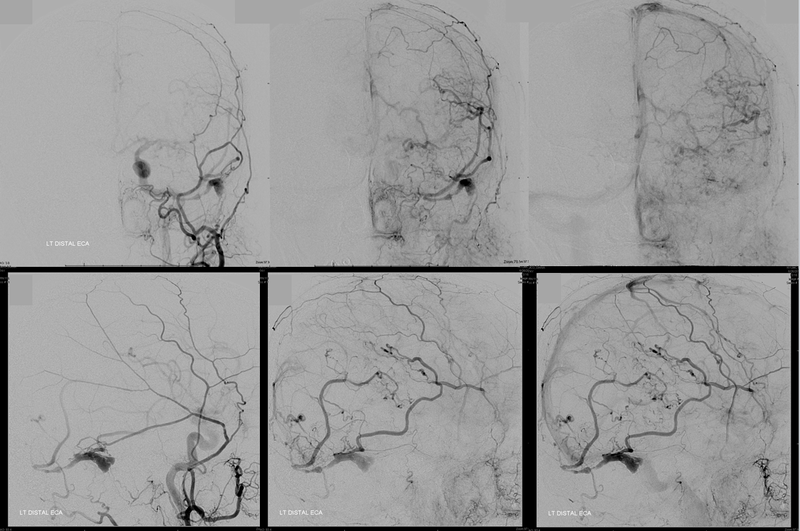 Distal ICA injection is a bit better at showing breakdown of cortical veins in the lateral view and contrast leakage into perivenous spaces. The value of collateral superficial venous connections cannot be overstated. 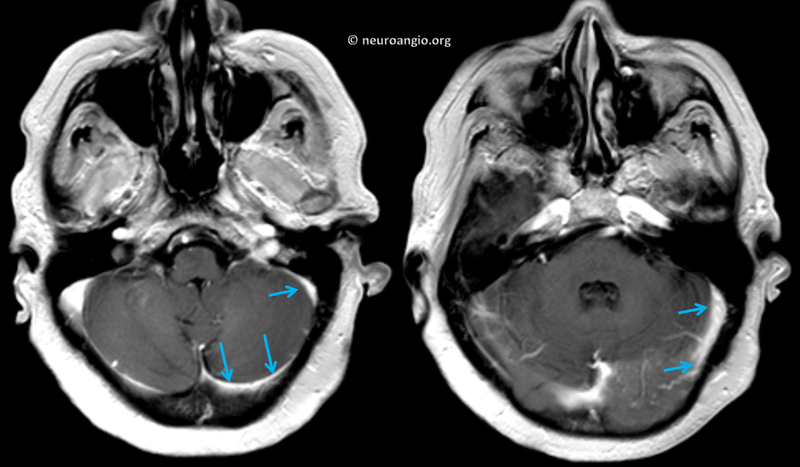 For example, in a different patient, similar venous sinus occlusion with exclusive cortical fistula outflow produced no symptoms except for headache, due to extensive collateralization which enabled the cortical venous system to decompress into the superior sagittal sinus. For full review of this Cognard IIb case, click here. Back to our case. 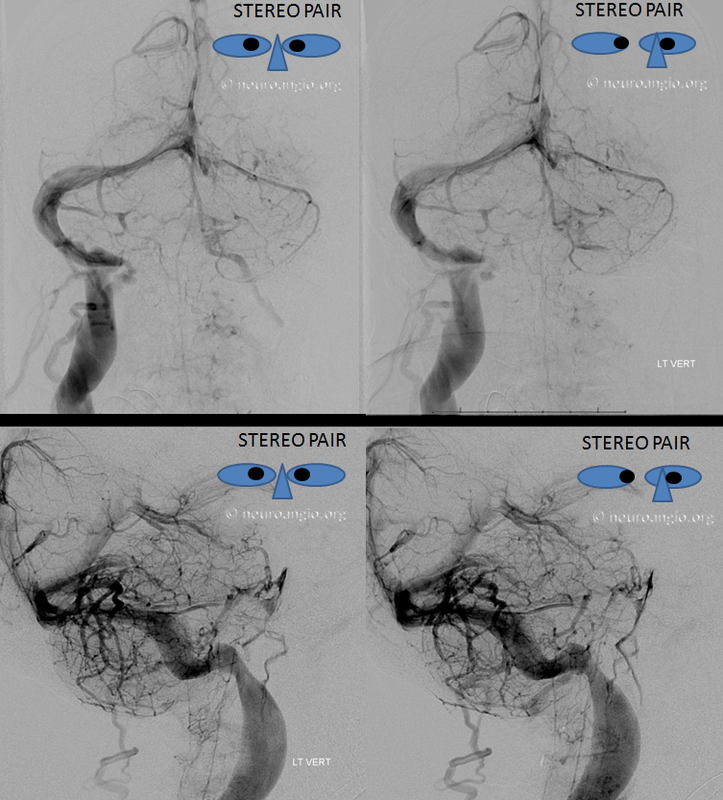 Stereo pairs of arterial phase. 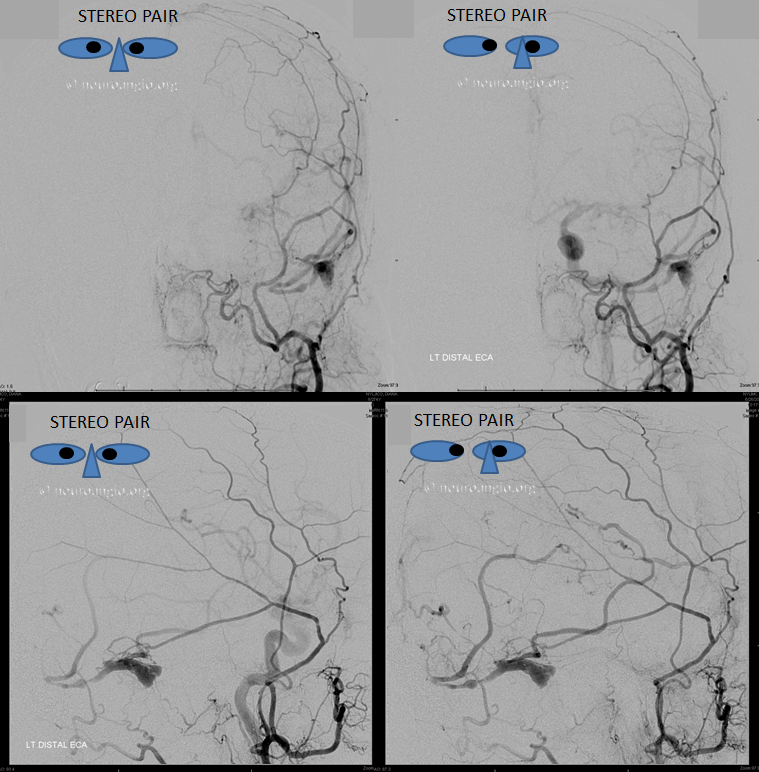 Transarterial approach treatment, with distal occipital catheterization (left) and nBCA cast (right). Prior attempts at transvenous access to the pouch via both transverse and sigmoid sinuses were unsuccessful. I use an 016 wire, but nothing stiffer. Some operators, with perhaps more experience and confidence, use 035 wires to attempt getting through these occlusions. So far i have not felt like doing so. The money shot is nearly always from the middle meningeal. Because of the microanatomy of the shunt region, we chose to use a Scepter C 4×10 balloon to assure ourselves of a wedge position close to the fistula, followed by nBCA injection. 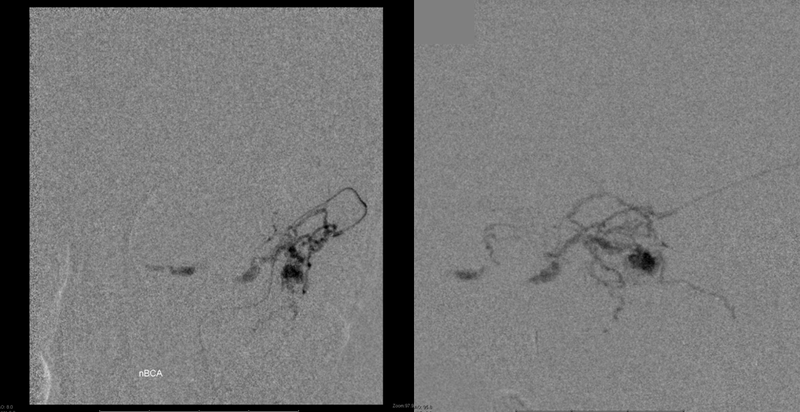 Pre-nBCA microcatheter images show wedge position with no contrast reflux along the MMA. Glue shot cast, with excellent penetration across the fistula into the venous pouch. 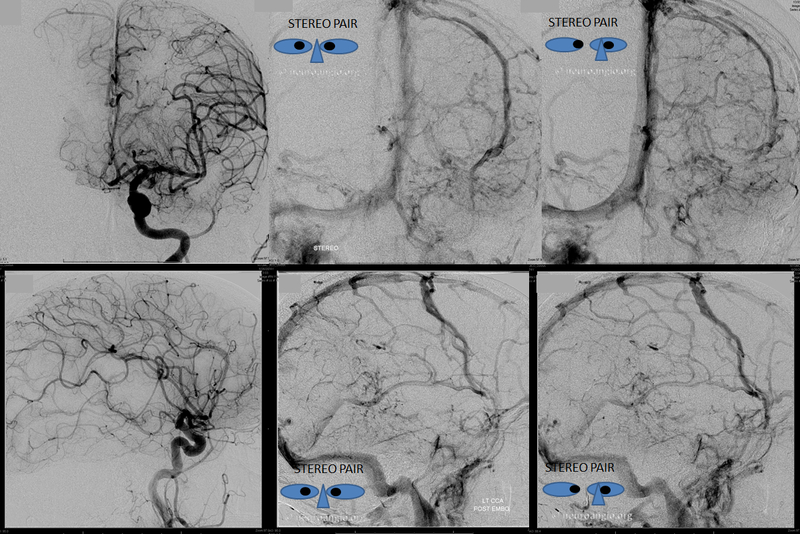 Post-embolization CT scan shows interval growth of venous infarction (between last CT and end of procedure) with extensive contrast staining of the congested area, including more hyperdense foci of frank contrast leakage. So far, recovery has been predictably slow.